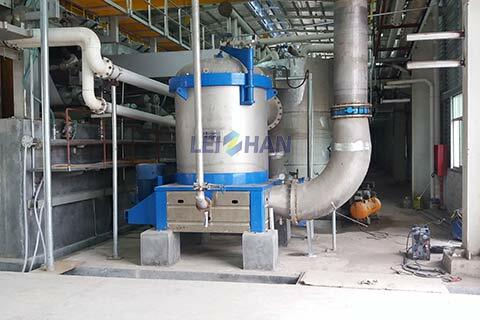 Paper Machine Approaching system includes: 1# finished pulp chest and pulp pump, 2# finished pulp chest and fan pulp, regulating mixing chest, white water tank, fan pulp, pressure screen before paper machine, vibrating screen, headbox, and the relevant pipes, valves etc. Pulping system brings slurry with steady concentration, firstly bring it to 1# finished pulp chest, and then bring it to 2# finished pulp chest from 1# finished pulp chest. Finished pulp chest should equip reliable pulp chest agitator. Make sure slurry is stable and consistent, and reduce air into slurry. 2#Finished pulp chest needs to keep a high and stable pulp level, set reflux inlet, redundant slurry flow back into 1# finished pulp chest. 2#Finished pulp chest fun pulp transports slurry into regulating mixing chest pulp inlet. The slurry of regulating mixing chest outlet is sent to stand pipe before fan pulp, redundant slurry flow back into 2# finished pulp chest, thus the slurry, which crushes into fan pulp, can have a steady pressure head, the flow of slurry crushing into fan pulp is steady under the circumstance that proportional valve opening degree is certain. In case of slurry consistency is steady, finally attain the goal of stabilize paper machine manufacturing ration.